Sendai station is the main and probably the only train station in the city of Sendai where you will arrive. Once you arrive at this station, which is located in the center, you can move on foot, by subway, by train, by bus. 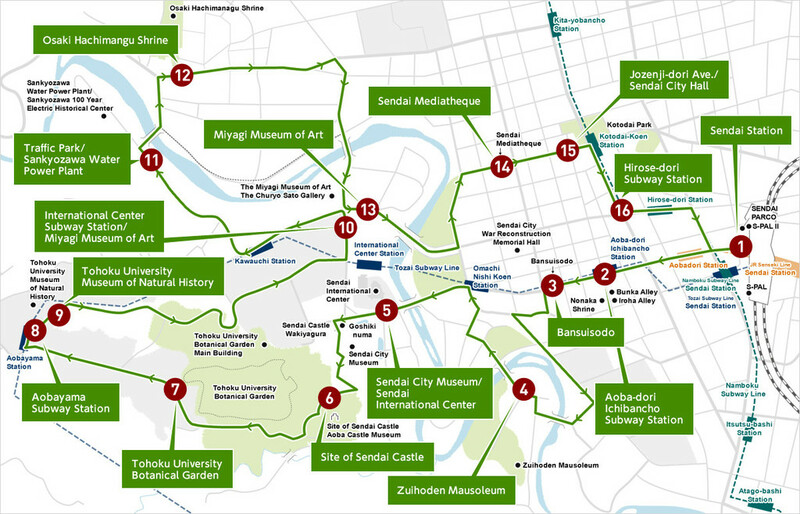 The easiest way to visit all the tourist attractions you are interested in is to use the Loople Sendai, a bus line specifically for tourists. The Loople Sendai starts its route from Sendai Station, after leaving the station it goes around the city for about 70 minutes before going back to the station. Sendai Station is then both the first and the last stop of this bus. During the journey, it makes a stop near practically all the attractions of the city. As you can see in the image below, there is only one direction of travel. There are three types of tickets available for purchase. The one-day pass costs 620 yen, a em>single-ride ticket costs 260 yen. There is also another one-day pass which allows to take both the Loople Bus and the metro, which costs 900 yen. One-day passes can be purchased at 1) JR Sendai Station West Exit Bus ticket office 2) 21 hotels and accommodations in Sendai City (a full list here) 3) Sendai Aoba Castle Museum, Zuihoden Mausoleum and Sendai International Center 4) Directly on board asking the driver, but if you are unlucky he might have no more of the tickets left to sell. The Loople Sendai runs every 15 minutes on Saturdays and Sundays, in August and on some holidays, every 20 minutes on other days. The first departure of the day leaves Sendai station at 9 am, the last departure leaves at 16 pm, goes around the city and goes back for the last time to Sendai Station at 5:10 pm. On some days the last ride might be very crowded and the bus might be full! You can use this service in two ways. You can get on board, sit down, and take a trip around the city and then return to Sendai Station, or you can get off at the stops you are interested in, visit what you want to visit, and then take the bus again to the next destination you are interested or to return to Sendai Station. Of course it is better to buy the one-day pass if you plan more than 3 rides. Inside the bus there are also announcements in English that inform about the next stop. If nobody has done it, just press one of the specific buttons on board before the stop you want to get off, just to make sure it will stop there. If you have purchased a one-day pass, just show it to the driver before you get off, and if it is the first ride you must also punch your ticket before getting off. If you want to take a single ride, you do not have to buy the ticket first, but pay 260 yen to the driver before getting off. You can also use Suica and Pasmo or 1000 yen banknotes, a machine will give you the change. You get on board only from the central door and exit only from the front door, passing necessarily in front of the driver. Anyway, for up-to-date information on timetables and prices, we recommend to take a look at the official website. If you have a one-day pass, you can get some small discounts in various places and tourist attractions of the city. At this link you can find the complete list. We hope you do not waste too much time surfing the internet while visiting Sendai, but even just to check the map you will be able to use free wifi both on the bus and near each bus stop. 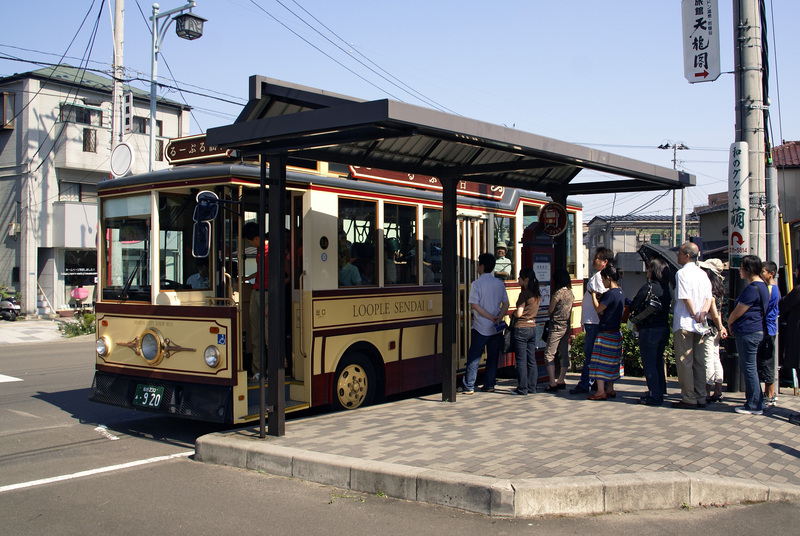 Even if you do not have to take the bus, if you need internet just look for a bus stop of the Loople Sendai. The city of Sendai has two subway lines: the Namboku Line which runs through the city from north to south, and the Tozai Line which runs through the city from east to west. The two lines have only one interchange station, Sendai Station. The subway is not necessary if you are a tourist and you want to visit the city, moving on foot or by bus is more convenient, easier and cheaper. You can find detailed information on how to use the metro and city buses in the excellent official website in English. Sendai Station is a large JR interchange station, served by high-speed trains shinaksen but also by several local lines: the Tohoku Main Line, the Senzan Line, the Senseki Line, the Joban Line. The Tohoku Main Line is useful to go to the north (Morioka, Aomori) or to the south (Koriyama, Tokyo) without using the shinkansen. The Senzan Line connects Sendai with Yamagata. It is very useful to go to Yamagata and eventually continue to Akita with local trains, or to visit the Yamadera Temple, located along this line. 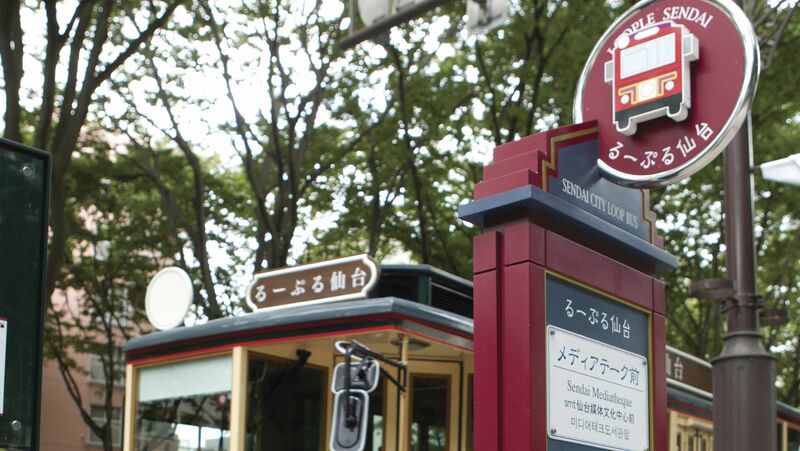 15 minutes walk from Kunimi Station there is also the Osaki Hachimangu shrine. The Senseki Line is very important if you want to visit the area of Matsushima. The Joban Line connects Sendai with Tokyo passing near the coast, but there are no famous tourist destinations along this line near Sendai.